The mandible is the second most common facial fracture, with the nasal bone being the first. Knowledge of the anatomy of the mandible and the muscular forces applied to it is the key to proper reduction of mandibular fractures. The goal in reduction is to restore premorbid occlusion, allowing patients to resume masticatory functions. Prior to repair, patients must be thoroughly evaluated. As with any trauma, the fundamentals of good trauma care must be followed. The airway must be secured, and breathing and circulation must be confirmed. Possible cervical spine (C-spine) injury needs to be ruled out. With mandibular fractures, earlier reduction is associated with better outcomes. Although, if other injuries dictate, repair may be delayed 5-7 days, surgical correction is recommended as soon as possible. Current concepts include early intervention with wide surgical exposure to allow for precise alignment and rigid fixation. An image depicting mandible anatomy can be seen below. For excellent patient education resources, visit eMedicineHealth's First Aid and Injuries Center and Oral Health Center. Also, see eMedicineHealth's patient education articles Broken Jaw and Broken or Knocked-out Teeth. The first descriptions of treating mandible fractures date back to Egypt around 1650 BC. Hippocrates talked of reapproximation and immobilization. Proper occlusion was first addressed in 1180 in Salerno, Italy. Fixation of the maxilla to the mandible was first used in 1492. In the 1950s, the Arbeitsgemeinschaft für osteosynthesefragen/Association for the Study of Internal Fixation (AO/ASIF) was founded. Early AO plates were stainless steel. Other materials included cobalt-chromium and titanium. Most internal fixation systems use titanium or a titanium alloy. Currently, resorbable plates are being investigated. Early techniques used to immobilize mandible fractures included bandage immobilization and intermaxillary fixation. During World War II, realignment with open access and wire fixation was popular. More recently, a tremendous amount of fracture management with rigid plate fixation has occurred. Plates were made to span and stabilize the fracture. Plates were then developed to be either compression or noncompression. Furthermore, the compression plates could be made to compress the fracture in an eccentric manner. Compression is achieved by inclines built into the plate. When the screws adjacent to the fracture are activated, the fracture segments are forced together, resulting in primary bone healing. 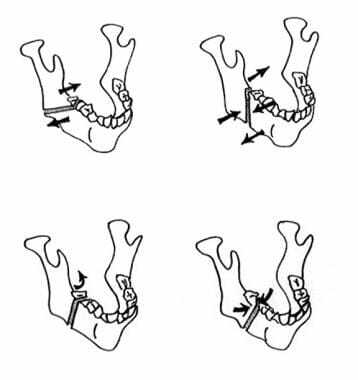 These forces can be directed at the inferior compression site of the mandible or superiorly to the tension aspect of the mandible. When an external force is imposed on the mandible that is strong enough to cause the mandible to fracture, the surgeon must anticipate associated injuries. Although a single blow to the mandible can yield an isolated fracture, more commonly, 2 sites are involved. The surgeon should always be wary if only one fracture site is identified. For example, trauma to the side usually yields an ipsilateral body fracture and a contralateral subcondylar fracture. A classic severe blow to the symphysis produces a symphyseal fracture and bilateral subcondylar fractures. 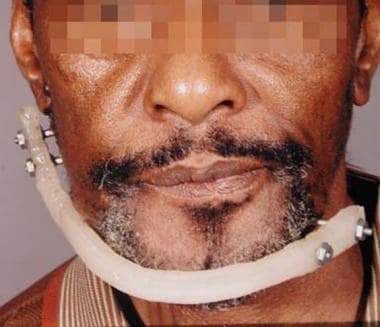 With bilateral fractures, parasymphyseal or body, always protect the airway from obstruction by the retrodisplaced tongue. In a motor vehicle accident or a gunshot wound, multiple fractures should be suspected along with injuries to the soft tissue, C-spine, and central nervous system. 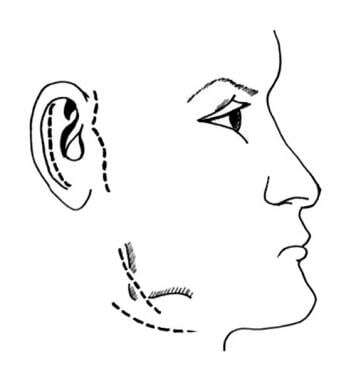 These concomitant injuries are seen in as many as 30% of facial trauma cases. These injuries may be life threatening and should be dealt with as a high priority. As in all patients with traumatic injuries, the airway should be secured, the patient should be breathing, and the circulation should be stable. The C-spine should always be assessed radiologically and clinically, and injuries here should be ruled out prior to manipulation of the neck. Some C-spine injuries can be asymptomatic. Appropriate consultations should be made to assess the patient. The secondary survey can then be performed, including a full head and neck examination. Airway compromise often accompanies mandible fracture. Causes can include intraoral bleeding, edema, loose teeth or dentures, and posterior displacement of the mandible and/or tongue due to a flailed segment of the mandible. Consider an emergent tracheotomy or a cricothyrotomy when an obstruction persists despite use of basic cardiopulmonary resuscitation (CPR). Treatment goals are to restore function and premorbid occlusion. Mastication, speech, and normal range of oral motion should be achieved. Contour defects must be corrected. Early treatment curtails the possibility of infection. The types of fractures commonly seen due to motor vehicular accident have decreased significantly with the use of restraint devices. The symphyseal and bilateral parasymphyseal fractures caused by the mandible striking the steering wheel or dashboard are rarely seen in patients using a seat belt. The average number of mandibular fractures per patient is 1.5-1.8. Ten percent of patients have more than 2 fractures. Because of the inherent design of the mandible, a unilateral fracture is rare. Children younger than 6 years make up only 1% of the total number of cases. Of note, children with mandibular fractures often have other associated injuries. History can help in the diagnosis. Underlying bone disorders and previous mandibular trauma may predispose a patient to traumatic fractures. The type and direction of force are important, as is the object causing the fracture. Symptoms often described include pain, trismus, difficulty chewing, and anesthesia or paresthesia of the lower lip and chin. On examination, findings include abnormal mandibular movements, malocclusion, change in facial contour and mandibular arch form, tenderness, swelling, redness, lacerations, hematoma, and ecchymosis. Loose and fractured teeth should be evaluated and counted. If teeth are missing, consider a chest radiograph to rule out aspiration. Premorbid occlusion can be confirmed by examining the wear facets on the surfaces of the opposing teeth. Patients are quite sensitive to changes in their occlusion and can appreciate displacements smaller than 1 mm. It must be remembered that not all patients have ideal occlusion (ie, only 74% of the population have an Angle class I bite). The remainder has either retrognathia (Angle class II, 24%) or prognathia (Angle class III, 1%). 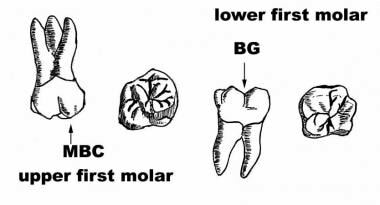 Angle classification is based on the relationship of the mesial-buccal cusp of the maxillary first molar to the buccal groove of the mandibular first molar. (Mesial is anterior in reference to the sagittal plane and distal is posterior to that same plane.) Anatomy is shown in the image below. Anatomy of the first molars. Oral and maxillofacial surgeons also use the relationship of the canine teeth to determine the occlusal class. Class I occlusion refers to the mesial-buccal cusp of the maxillary first molar's contact with the mandibular first molar's buccal groove. The mesial-buccal cusp lies in front of (or mesial to) the groove in class II occlusion. In Angle class III occlusion, the mesial-buccal cusp of the maxillary first molar falls behind (or distal to) the groove. Fractures that occur in the region of the teeth are considered to be compound fractures, which can be predisposed to bacterial contamination from the oral cavity. An open laceration and bleeding from the site also may be evident with compound fractures. These types of fractures should, therefore, be prophylactically treated with antibiotics. If the mucosa has not been violated, then clinical findings can be limited to ecchymosis. If the third division of the trigeminal nerve (the inferior alveolar or mental nerve) has been injured, the patient may have paresthesia or anesthesia of the chin. Documenting this and the function of the marginal mandibular nerve (branch of cranial nerve VII) is important prior to surgical intervention. The nerve course is shown in the image below. 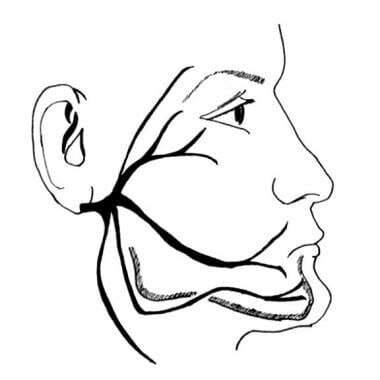 Course of the facial nerve. Spasm of the muscles of mastication due to trauma can result in trismus, limiting a proper oral examination. Facial edema, erythema, and pain are also associated with mandibular fractures. Bilateral parasymphyseal/body and, at times, subcondylar fractures can result in the posterior displacement of the tongue, leading to airway compromise. In accordance with the tenets of trauma care, the airway should always be addressed first. The fracture may be classified as simple, greenstick, compound, comminuted, or pathologic. Furthermore, classification can take into account forces influenced by muscular distraction. Muscular force can act favorably (nondisplaced fracture) or unfavorably (displaced fracture). Displacement can occur in either the horizontal or the vertical plane. Favorable and unfavorable fractures are shown below. Favorable and unfavorable fractures. Top: Horizontal reference. Bottom: Vertical reference. Generally, some form of therapy is needed for a fracture of the mandible. Perform the most conservative treatment that allows for reduction of the fracture while preserving the premorbid occlusion. Historically, for minimally displaced fractures that were of a favorable type, a Barton-type head bandage gave enough support for the fracture to heal. This was especially true in children. A liquid or pureed diet was maintained for 4 weeks. The trends currently advocate early surgical intervention, wide access to the fracture site, and complete immobilization with rigid fixation. Factors affecting fragment displacement include the direction and intensity of the traumatic force, direction and bevel of the fracture line, presence or absence of teeth in the fragments, direction of muscle pull, and extent of soft-tissue injury. In a favorable fracture, the muscle pull promotes splinting of the segments; muscle pull distracts the segments in an unfavorable fracture. Muscles involved in opening the mouth include the anterior belly of the digastric muscle and the mylohyoid, geniohyoid, and genioglossus muscles. Oral closure is provided by the action of the temporalis, masseter, and the internal (or medial) pterygoid muscles. The only protrusion from the mandible is the external, or lateral, pterygoid muscle. The forces of these muscle groups, along with the bevel and angle of the fracture, determine whether or not a fracture is favorable or unfavorable. 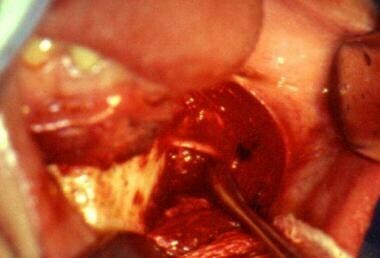 If external dressings are not sufficient, closed reduction can be accomplished with maxillomandibular fixation (MMF), formerly known as intermaxillary fixation (IMF; shown in the image below). Maxillomandibular fixation using arch bars retained with composite resin. Cawood has described many ill effects of MMF when arch bars and ligatures are used. To avoid these types of issues, 4-point MMF can be used, as depicted in the image below. Otherwise, arch bars are placed with wire ligature (24-26 gauge) or composite resin. Four point fixation for maxillomandibular fixation. Open reduction is an excellent modality for fracture segment reduction. After MMF, an incision is made to allow for direct alignment of the segments. Access can be achieved via either an intraoral or extraoral incision, depicted below. To maintain fixation, titanium plates and screws or stainless steel wire may be used. Even with an incision, percutaneous access may be needed for the placement of plates, screws, or wire. External fixation, shown in the image below, was popular in World War II but currently is not often employed. Principle indications are sites that have been infected or pathological fractures. It can also be used in edentulous patients with unstable fractures. Stainless steel pins and composite resin placed lateral to the mandible keep the fracture rigidly reduced. When an infection or severe comminution is present, an external fixation device may be used. Other alternatives include use of the patient's dentures to reduce the fracture. 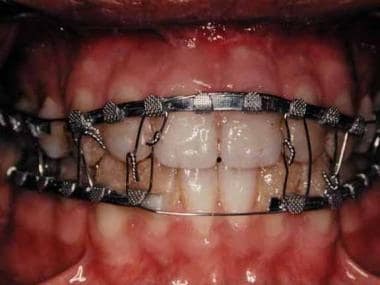 The dentures act as a splint, and with the use of circumferential mandibular wires, they can stabilize the fracture, as shown below. The upper and lower dentures can be wired together to maintain MMF. If the patient is edentulous but without dentures, a Gunning-type splint can be fabricated and used in the same manner as dentures. When dentures are available, they can be used with the circummandibular wire technique. The mandible is derived from the first branchial arch. Its bone is membranous in nature. Ossification is by direct mineral deposition into the organic matrix of mesenchyme or connective tissue. Bone matrix is 35% organic and 65% inorganic, and 90% of the organic component is type I collagen. Hydroxyapatite makes up most of the inorganic portion of bone. The mandible is divided into the condylar, subcondylar, ramus, angle, body, parasymphyseal, symphyseal, coronoid, and dental alveolar regions. The structure of the mandible is such that masticatory force trajectories are transmitted to the skull base, but the jaw usually fractures prior to penetration of the middle cranial fossa. 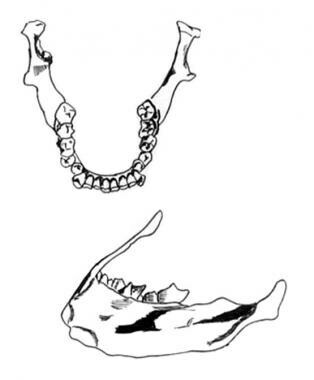 This design permits great forces on the mandible to be distributed along its frame, shown in the image below. If the stress is great enough, the mandible fractures and absorbs the impact, thereby lessening the forces on adjacent vital structures. Knowledge of the anatomy of the mandible and surrounding soft tissues aids in the proper reduction of fractures. The third division of the trigeminal nerve enters the mandible, at the lingula, as the inferior alveolar nerve (IAN). The lingula is also the point of attachment for the sphenomandibular ligament. The IAN gives off dental branches before exiting the mental foramen, located between the first and second premolar teeth, in the lower third of the mandible as the mental nerve, shown below. Knowledge of the path of the nerve and the length of the teeth is important in planning the placement of titanium plates and screws. Intraoral access with identification of the mental nerve. Dental occlusion is determined by the opposition of teeth of the upper and lower arches. Primary dentition starts with the incisors at 6 months of age, and all 20 teeth are present by age 2.5 years. The permanent teeth start with the eruption of the first molars around age 6 years, and the completion of the dentition takes place at age 16-20 years. The surfaces of the teeth help determine the premorbid occlusion. 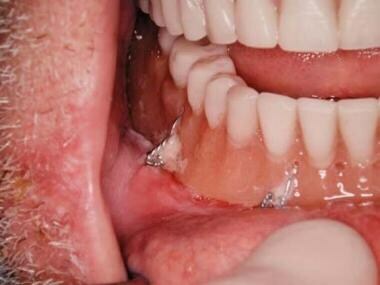 Wear facets can be identified and guide the surgeon to the proper occlusion. The cutting surface anteriorly is referred to as the incisal surface. The posterior teeth have occlusal, lingual, mesial, and distal surfaces. Between the teeth are embrasures or interdental spaces, which are used to place wire ligatures. This anatomy not only helps in the planning and execution of surgery, but it also is useful in communicating with other members of the surgical team. Prior to the management of mandibular fractures, the patient should be properly assessed. Reduction of fractures can be delayed until the patient is stable. Ideally, fracture reduction should be performed within 7-10 days. After this period, the risks of malunion, malocclusion, and facial asymmetry increase. In some situations, MMF may not be the best therapy, and open reduction with internal fixation may be a better alternative. Currently, no real absolute contraindications for open reduction with internal fixation exist. Two relative contraindications include poor bone height, and a pediatric mixed dentition that limits the placement of fixation devices. Ellis E 3rd, Walker LR. Treatment of mandibular angle fractures using one noncompression miniplate. J Oral Maxillofac Surg. 1996 Jul. 54(7):864-71; discussion 871-2. [Medline]. Ellis E 3rd, Miles BA. Fractures of the mandible: a technical perspective. Plastic Reconstructive Surgery. December 2007. 120:76-89s. Natu SS, Pradhan H, Gupta H, Alam S, Gupta S, Pradhan R, et al. An epidemiological study on pattern and incidence of mandibular fractures. Plast Surg Int. 2012. 2012:834364. [Medline]. [Full Text]. Kyrgidis A, Koloutsos G, Kommata A, Lazarides N, Antoniades K. Incidence, aetiology, treatment outcome and complications of maxillofacial fractures. A retrospective study from Northern Greece. J Craniomaxillofac Surg. 2013 Oct. 41(7):637-43. [Medline]. Manson, PN. Facial fractures. Mathes, SJ. Plastic Surgery. 2nd. Philadelphia: Saunders Elsevier; 2006. Chapter 66, pp 77-380. Scvhmidt BL, Kearns G, Gordon N, Kaban LB. A financial analysis of maxillomandibular fixation versus internal rigid fixation for the treatment of mandibular fractures. J Oral Maxillofac Surg. November 2000. 58(11):1206-10. Shetty V, Atchison K, Leathers R, Black E, Zigler C, Belin TR. Do the benefits of rigid internal fixation of mandible fractures justify the added cost? Results from a randomized controlled trial. J Oral Maxillofac Surg. November 2008. 66(11):2203-12. Miles BA, Potter JK, Ellis E 3rd. The efficacy of postoperative antibiotic regimens in the open treatment of mandibular fractures: a prospective randomized trial. J Oral Maxillofac Surg. April 2006. 64(4):576-82. Abdel-Galil K, Loukota R. Fractures of the mandibular condyle: evidence base and current concepts of management. Br J Oral Maxillofac Surg. 2010 Oct. 48(7):520-6. [Medline]. Mizuhashi H, Suga K, Uchiyama T, Oda Y. Changes in mechanical properties of poly-l-lactic acid mini-plate under functional load simulating sagittal splitting ramus osteotomy. Int J Oral Maxillofac Surg. 2008 Feb. 37(2):162-9. [Medline]. Valiati R, Ibrahim D, Abreu ME, Heitz C, de Oliveira RB, Pagnoncelli RM. The Treatment of Condylar Fractures: to open or not to open? A critical review of this controversy. Int J Med Sci. 2008. 5(6):313-8. Eulert S, Proff P, Bokan I, Blens T, Gedrange T, Reuther J, et al. Study on treatment of condylar process fractures of the mandible. Ann Anat. 2007. 189(4):377-83. [Medline]. Schoen R, Fakler O, Metzger MC, Weyer N, Schmelzeisen R. Preliminary functional results of endoscope-assisted transoral treatment of displaced bilateral condylar mandible fractures. Int J Oral Maxillofac Surg. 2008 Feb. 37(2):111-6. [Medline]. Coletti DP, Salama A, Caccamese JF Jr. 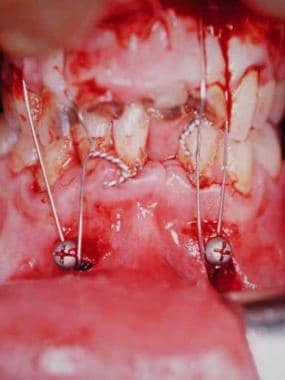 Application of intermaxillary fixation screws in maxillofacial trauma. J Oral Maxillofac Surg. 2007 Sep. 65(9):1746-50. [Medline]. [Guideline] Barker DA, Oo KK, Allak A, Park SS. Timing for repair of mandible fractures. Laryngoscope. June 2011. 121(6):1160-3. Top: Inferior compression plate. Bottom: Eccentric compression plate. Radiograph of an oblique parasymphyseal fracture amenable to use the lag screw technique. Reduction using the lag screw technique. Fracture reduced with 2 screws used in the lag screw fashion. Using percutaneous access in the difficult angle region. A minimally displaced posterior mandible fracture. Intraoperative view with external oblique ridge in view, situation ideal for Champy technique. A monocortical plate configured in 2 dimensions to fit at the external oblique ridge. Postoperative radiograph. Patient had an open reduction with internal fixation (ORIF) using the Champy technique and is not in maxillomandibular fixation.